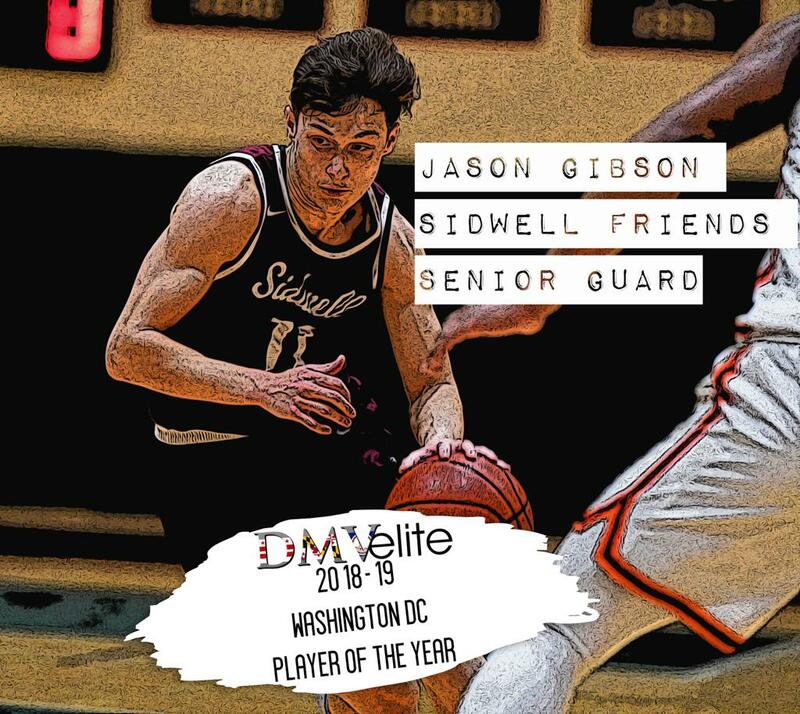 Sidwell Friends 2019 Guard Jason Gibson. [PHOTO BY RON BAILEY | GRAPHIC BY JAY ANDERSON]. With the 2018-19 high school basketball season firmly in the rearview mirror, we are proud to announce our All-District selections for Washington, D.C.
Our staff would like to thank the players, coaches and fans who made this past season – our ninth year of high school coverage – a success, and we look forward to many more. In addition to this All-DC team (which features only players from schools located in the District), we'll be rolling out All-Maryland and All-Northern Virginia teams this week, culminating in our overall All-DMVelite squad. In his first year as the offensive focal point, Gibson delivered, averaging a team-best 20.8 points for the DCSAA AA champion Quakers. Gibson stuffed several other stat categories as well, putting up 4.9 rebounds, 4.1 assists and 2.8 steals per game. The Towson University commit excelled while leading Sidwell on its run through the DCSAA Tournament, hitting a game-winning buzzer-beater in a quarterfinal win over McKinley Tech, scoring a game-high 28 in a semifinal win over St. John’s, and capping it with a game-high 24 in the title game victory against Wilson. Singletary lost his top player - Villanova freshman guard Saddiq Bey - to graduation. Instead of taking a step back, he guided the Quakers to one of their most successful finishes in school history, capped with a thrilling DCSAA title victory against heavily-favored Wilson. Barnes was one of the more underrated performers in the City, giving the Lions a steady performer night in and night out while leading on both ends of the court. The versatile Gill put together a strong senior campaign to help the Purple Eagles claim the Washington Catholic Athletic Conference title, posting 12 points, 6 rebounds and 3 assists per game. The Boston College-bound Heath stepped into the point guard spot opened by the graduation of 2018 DMVelite DC POY Ayinde Hikim and thrived, earning DCIAA Player of the Year honors and guiding the Tigers to their third straight DCIAA title. A transfer from St. John’s, Jackson shined in his first season at KIPP, guiding the Panthers to the inaugural DCSAA Class A championship. He posted 21 points, 8 rebounds and 7 steals in the title game victory against SEED. The Yale-bound Jarvis was a dominant force for the Frogs, averaging 22 points, 10.9 rebounds, and 2.9 blocks per game (all team-highs) to lead them to a 20-8 record. The Maryland commit was a force inside for the Tigers, helping guide Wilson to the DCIAA crown in his lone season in Tenleytown. The WCAC Co-Player Of The Year averaged a team-high 17 points per game while also pulling down 5.5 rebounds and dishing out 3 assists per game to lead the Cadets on a run to the WCAC title game. Morsell is headed to The University of Virginia. Stevens was a matchup nightmare all season, providing potent perimeter shooting and high-flying finishes in transition for the DCIAA champs. Williams averaged a team-high 17.9 points and 7.3 rebounds per game for the WCAC Champions. Williams broke out in his final season, doubling his scoring average from his junior campaign (form 8.8 points per game to 17) and guiding the Trainers to the a runner-up finish during the regular season.